A native of the Florida Keys and the Caribbean, the buccaneer palm is notable for extremes...drought-tolerance, salt-tolerance and a growth rate slow as molasses. Rare and unusual, no two buccaneers look alike. They can range in color from green or light green to blue green or completely silver. The swollen trunks on mature specimens vary in shape - and the subspecies saonae develops a heavier trunk than sargentii. This striking Florida native palm is not well known and used infrequently in home landscapes, but it deserves a place in warmer areas of South Florida as a focal point in tropical or coastal gardens. 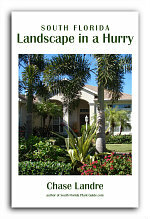 Since it's very slow-growing and sensitive to cold, the buccaneer is a perfect small palm to grow close to the house. The fronds' stems spread out in a flat, fan-shaped pattern, much like a tiny blue-green traveler's palm, especially while the palm is young. 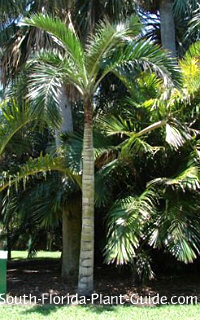 One of the most slow-growing South Florida palm trees, the buccaneer palm can eventually grow to 10 to 15 feet in Zone 10B, the recommended coolest zone for this palm. 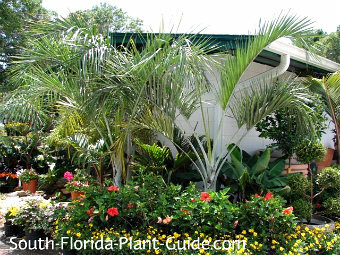 In the few existing natural stands left in Florida, some of these palms may reach 25 feet, but in a home landscape, expect only about 10 or so feet in height. Though the buccaneer does best in warmer and coastal areas, it can be grown in Zone 10A (with winter protection) in a sheltered spot in the landscape, or in a container that can be moved inside or kept in a more protected area like a pool cage. 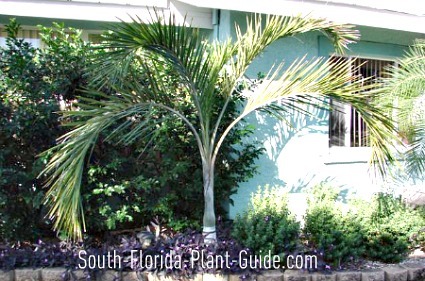 It's pest-free and very drought- and salt-tolerant, making it an ideal accent palm for warm, seaside locations. This palm can take full sun to partial shade but actually prefers some shade, especially when young. The fronds can reach anywhere from 4 to 10 feet in length; the more shade, the longer the fronds will grow. Slow-growing palms like the buccaneer can be more pricey than other palms...it takes the nurseryman more time to grow it and get it ready to sell. The buccaneer palm develops a self-cleaning habit as it matures, though you may have to prune off a frond now and then while it's young. Don't bother adding soil amendments when you plant, since the buccaneer likes our sandy soil. It can take a hit from colder temperatures. If frost or near-freezing cold is predicted, cover the palm with frostcloth or a thick blanket. 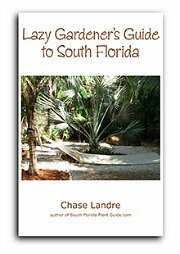 Not choosy about nutrition since it's a native to poor soil, the buccaneer, like all palms, still appreciates fertilization once a season in spring, summer and fall with granular palm fertilizer. 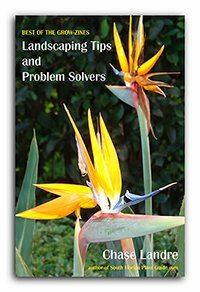 Allow 10 feet between palms if you're planting buccaneers in a line along a wall or drive. Come out from the house 3 to 4 feet to make sure the palm won't hit eaves or gutters eventually. When you plant a buccaneer by the entry, situate it so the eventual length of the fronds won't be in the way. These are great container palms, since they grow so slowly. Confined to container for a long period of time tends to keep the palm's fronds shorter in length. COMPANION PLANT SUGGESTIONS: Plant with other drought-tolerant or salt-tolerant plants such as crown of thorns, clusia, simpsons stopper, baby sun rose, carissa, Indian hawthorne, pittisporum, Schillings (dwarf yaupon) holly and agave.